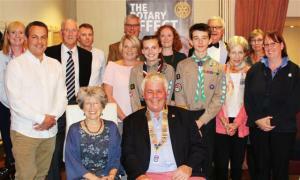 Rotary Club of Ledbury - welcome! Please scroll/swipe down through this page to find out more about us, in addition to the pages linked in the menu, top-left. As usual Ledbury Rotarians entertain the Evergreen club members and helpers at a party at St Michael's. Rotary's float at the Carnival won 2nd prize. If you want to have fun and make lasting friendships with an amazing bunch of local profesional men and women whilst helping people less fortunate than you then come and join us. If you would like to come to a meeting please use the contact envelope at the bottom of this page and we will get back to you. We have a wide range of interesting speakers and topics at our meetings - details on the website are updated as required. Ledbury Rotary's Community Chest for 2019 is now open. We especially welcome applications from groups working with the young and the old in Ledbury. Please use the contact us form to request an application form . Martin Perry will be talking about his recent trip to St Helena.